Mead, or honey wine, is perhaps the oldest of alcoholic beverages. Simply put, it is wine made from honey instead of grapes. Like grape wine, it can be crafted with either a dry or a sweet finish. Medovina produces its own honey, from which it hand crafts its mead. Our beeyards are nestled in Old Town Niwot, in the shade of large cottonwoods planted nearly a century ago by early homesteaders. In what is truly a miracle of nature, flowers use photosynthesis to transform atmospheric carbon dioxide and water to nectar, a complex blend of sucrose and trace amounts of aromatics, essential oils and other delightful compounds. The bees gather this nectar from the unique flora in the Niwot area. The bees provide vital enzymes which break down the nectar into simple sugars. Inside our beehives, and over the course of several months, the nectars transform naturally into a consistently rich, premium honey. As summer gives way to autumn, Medovina begins harvesting the honey and crafting its mead. Our Old World process preserves the rich floral extracts present in our honey. Our meads are produced naturally, without filtering or added sulfites. Alcohol, honey and acidity are harmonized by producing our meads slowly, in small batches, and barrel aging them before bottling. Further aging occurs naturally in the bottle and full maturity can be expected in 3 to 8 years, but you do not have to wait that long to enjoy them. 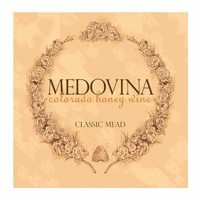 Medovina honey wine is a unique culinary experience, try it on a fresh palate: take three sips, then decide.Medovina produces honey, from which it hand crafts mead. Our meads are produced naturally, without filtering or added sulfites. They are slow fermented and bulk aged for one year prior to bottling.